You've just decided that it's finally time for your child to learn how to use technology. The Amazon Fire HD 8 Kids Edition is a great way to introduce your kid to using a tablet. While it's in no way a toy, its construction and features are just right for any youngster for hours of educational play. In fact, the Amazon Fire HD 8 Kids Edition is just a great little starter tablet. And even if you have children of different age ranges, they’re all likely to have a blast with it. Suited for children ages 3 to 10, perhaps even up to 12, the Amazon Fire HD 8 Kids Edition features the same performance as the Fire HD8 for adults, with a few add-ons. First comes the foam case that protects the Amazon Fire HD 8 Kids Edition from bumps and bruises. The puffy protective foam case comes in pink, blue, or yellow and features rounded edges and a textured surface to make it easier for small hands to hold. Because of its foam construction, it also has a little bounce and give, which also makes it less likely to hurt if it gets dropped on – or thrown at – a sibling. Underneath the bright-colored foam cover is the regular black case of the Amazon Fire HD 8 for adults. The benefit here is that your child can still use it when they outgrow the “kids edition” factor. While the foam case protects the Amazon Fire HD 8 Kids Edition from bumps and bruises, it won’t stand up to a bubble bath. And there are stories of children shoving food into the slots. That’s why Amazon offers a 2-year, no questions asked warranty on their kids' edition Fire tablets. No matter what the little angels do to it, they’ll replace it free of charge for two solid years. Much like their Prime service for adults, Amazon’s FreeTime children’s programming includes age-appropriate games, books, videos, and apps. This service proves to the be the most-loved features of the Amazon Fire HD 8 Kids Edition and makes it worth the money alone. FreeTime Unlimited features over 15,000 activities, books, and more from well-known children’s entertainment providers like Disney, PBS Kids, and Nickelodeon, And new content coming in Fall 2018 includes Audible books and Spanish language programming. 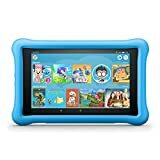 Best of all, parents have the most exacting control over the functions and programming included with the Amazon Fire HD 8 Kids Edition. While the above features distinguish the Amazon Fire HD 8 Kids Edition from the adult model, it's worth looking into how well it functions and what kind of performance you should expect. First of all, the tablet functions as well as the version for adults, but some industry experts find it a bit slow. With a quad-core 1.3 GHz processor and 1.5 GB of RAM, the FreeTime user interface may cause some lag when switching between apps. Like all of Amazon’s tablets, the Amazon Fire HD 8 Kids Edition runs on the Fire OS, which is similar to Android. Older kids and parents alike may become frustrated with this model when trying to use it outside Amazon’s proprietary system. While it’s possible to add Google Play to download non-Amazon apps, it uses a great deal of space and time to do so. So, although the Amazon Fire HD 8 Kids Edition could conceivably grow with your child into their tween and teen years, you may find it not worth the time or effort. While the Amazon Fire HD 8 Kids Edition comes with 32 GB, you can add a microSD card. That could prove a valuable feature if the tablet has more than one user, including yourself. While there is so much FreeTime content available, you’ll have to download it before leaving any Wi-Fi connection to watch later. Luckily, the MicroSD card slot is under the child-friendly case, and less likely to be stuffed with peanut butter. Amazon boasts a 12-hour battery life, but most tech reviewers and owners found that it lasts just a tad longer. Changes in the next generation will mean a shorter battery life in exchange for extra Alexa features once the model releases. But for the 7th Generation model, those 12 hours are pretty impressive and becomes even more so once your child downloads their favorite movies for long trips. The 8-inch high definition display is bright and impressive, and even movies with special effects look great. The two Dolby Atmos speakers are a definite plus point. And while they don’t handle a lot of bass without distortion, the sound is crisp enough for watching on your lap during a long car ride. Choosing what content to control or block is a personal decision for you and your family, and you can set up the Amazon Fire HD 8 Kids Edition with an exacting array of options. Along with blocking obvious adult-themed content, you can also set up custom rules. That means you can control screen time as well as how much time your child can spend on any given activity. For example, you can set education goals and tell the Amazon Fire HD 8 Kids Edition to block access to videos and games apps until they’ve logged the minimum amount of reading time or using educational apps. If you want, you can even set time limits on different types of content. You can also set it to turn on and off at certain times of the day, adjustable to fit different hours for each day of the week. And of course, you can always look at your child’s past activity to see how much time they’re spending reading, playing games, or using apps. Best of all, you can access your child’s tablet settings from the web. This means you don’t have to have the tablet in your custody in order to monitor their activities or change settings for access. Content division is into three age groups: 3 to 5, 6 to 8, and 9 to 12. However, you can customize their profile or add content from different age groups if you desire. You’ll find educational and entertainment products from a range of popular kids’ networks, like Disney, Sesame Street, Cartoon Network, and others. Along with filtering your child's content, the system blocks social media (unless you whitelist it) and in-app purchases. FreeTime is also available on other devices, not just the Amazon Fire HD 8 Kids Edition tablet. Use it on any Fire tablet, Kindle, or Android or iOS device. And once your free membership expires, Prime members can renew for $3 a month, and non-members can renew for $5 for a single child. Family memberships accommodate up for four kids for $7 to $10 per month, respectively. Lauded by several technology publications, the Amazon Fire HD 8 Kids Edition boasts the number one spot on the Digital Trends list of the best tablets for kids. Wired gave it 8 out 10, while Laptop magazine gave it 4.4 out of 5 for great content, superior parental controls, and its good-looking screen. Amazon customers rate it 4.3 out of 5 stars, with many happy users pleased with the parental control and its user-friendly interface. Best Buy shoppers give the Amazon Fire HD 8 Kids Edition 4.7 out of 5 stars, with many parents pleased by the ease of use. Target buyers gave this Fire tablet 4.7 out of 5 stars, with most buyers impressed by the high-definition screen and the easy to use interface. The Amazon Fire HD 8 Kids Edition is, of course, available from Amazon. Generally priced at around $130, you may find discounts down to $80, particularly around the holidays and on Prime Day. You’ll also find it on several consumer electronics store sites, priced from $129 to $180. While shopping for a tablet for your child, you may find a few other models that seem equally suitable. Some may also offer a lower price tag. So, let's take a look at two popular models to see how they compare. The Dragon Touch K8 offers the Amazon Fire HD 8 Kids Edition some competition with the pre-installed Kidoz network. Like the Kindle Fire model, it features a child-friendly interface and pre-installed software with educational and entertaining apps. The Dragon Touch only provides 16 GB of internal storage with 2 GB of RAM, while the screen features the same high resolution as the Kindle Fire model. But, unlike the Amazon Fire model, the Dragon Touch K8 has a built-in stand, which seems like a nice addition for children who enjoy watching videos. It comes with pre-installed Disney ebooks and audiobooks and offers advanced parental controls to time your child's use and set their access. It also learns about the user while they play and recommends content based on your child’s preferences. While parents rate the Dragon Touch tablet on Amazon at 4.4 out of 5 stars, it certainly doesn’t have the battery life and storage capacity of the kids’ Kindle Fire HD 8. You can expand it to 32 GB with a Micro SD card, but battery life only extends to 4 hours tops. While it doesn’t have every feature of the Amazon tablet, you can find it priced much lower, between $85 and $110, at many online stores. Founded in 1994, LeapFrog has been at the forefront of educational electronics for kids with their line of learning toys. First launched with their LeapPad learning toy, as technology has advanced, LeapFrog has developed tablets, apps, cartridge games, and even an activity tracker for children. 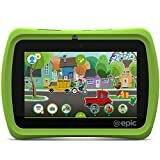 The LeapFrog Epic is a 7-inch Android tablet suited for kids between 3 and 9 years old. Parental controls allow up to three separate children's profiles. The operating system personalizes games to challenge your child as they grow, and it features a kid-safe web browser and 20 pre-installed apps. The Epic features an LCD screen, a protective bumper, 16 GB of memory, and a 2 MP camera. Like the other two models, you can expand the storage in the Epic with a MicroSD card. The screen is 1-inch less than the Amazon or Dragon Touch models, and not high definition, which impacts the viewing experience. While LeapFrog has always provided great educational toys for kids, sometimes they just haven’t kept up with the technology while usually falling on the pricey side compared to other companies. But, while the system easily accesses LeapFrog apps, you can also sideload content if the included content isn't enough for your child. Amazon buyers rated the LeapFrog epic at 3.6 out of 5 stars. Walmart buyers gave it 4.2 out of 5. And while many parents like the product, some complained that the additional games and apps were few and expensive. This has reflected our own experience with LeapFrog products. While the Amazon Fire HD 8 Kids Edition seems to be the best choice for kids’ tablets, you may find that it has some downsides to go with its bonuses. Compared to many tablets on the market for adults, the Amazon Fire HD 8 Kids Edition may not incite much enthusiasm in older children. However, for the price and the great content included, we think it's the best choice for kids. And that’s including the cost of the continuing subscription to FreeTime. While not simple to accomplish, you can set the Amazon Fire HD 8 Kids Edition up for an older child once they outgrow the FreeTime content. You can sideload both Amazon and Google Play apps through the adult profile if you choose to do so. You can also share Amazon content through the Family settings, which adds new content and stories your child can discover. The high def screen, Dolby Atmos dual speakers, and Bluetooth capability make this an excellent choice for kids on the go and will keep your child occupied for hours. With the expandable storage, they can access hours of their favorite movies and TV shows. The access to educational programming is also endless through both FreeTime and Amazon Prime, which hosts the broadest and unique range of documentaries you can stream. Last, but certainly not least, the included 2-year replacement warranty makes the Amazon Fire HD 8 Kids Edition a no-brainer for parents. 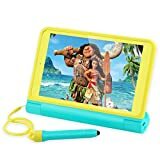 Amazon Fire HD 8 Kids Edition offers plenty of storage that you can upgrade further, Parental controls let you set learning activities as the priority but they are further costs to maintain the content subscription.